Besides just a restaurant-owner that was selling pilfered MacBooks, Apple's iPad and iPhones are continuing targets of thefts everywhere, including from a blind man at Six Flags, and trouble at a Kijiji meetup. The latest in an occasional AppleInsider series, the latest in Apple-related crime. Woman who stole MacBook Pro claimed she "thought she was dealing with terrorists"
A New Hampshire woman was arrested for stealing a $1,300 MacBook Pro from a businessman in a complicated scheme, and claims that she "thought she was dealing with terrorists and she was intercepting their merchandise." According to the New Hampshire Union Leader, a local electrician said that his company bank account had been hacked into in order to make the fraudulent purchase. The accused woman claimed that she had been "contacted by a company that was going to pay her to pick up packages, re-label them and ship them," leading her to believe that she was "dealing with terrorists." She later, however, admitted that she had sold the computer on eBay. The theft charge was "placed on file" after the woman agreed to pay back the money. A 34-year-old blind man had his iPhone taken from a Six Flags in Missouri, although police were later able to recover the phone. According to My Leader Paper, the man sent a text to the phone reading "you stole the phone from a blind man," and police later followed Find My iPhone to a residence, where the phone was found in the bushes outside. A masked thief stole 500 iPad Minis from an electronics warehouse in Florida, but was caught on surveillance video while doing so. According to the Sun Sentinel, the thief cut the power cord for the security camera, but not before 14 seconds of the theft were recorded:. Thieves broke into an elementary school in Santa Maria, Calif., and stole 25 iPads in mid-Novemebr. According to KSBY, teachers hope they can track the devices via Find My iPhone. We told you last time about the former city employee in Gary, Ind., who was accused of stealing over 1,000 iPads and is now accused of faking an illness that has rendered her unable to speak. Now, a federal judge has determined that the woman, Monique Bowling, is competent to stand trial. According to Northwest Indiana Times, Bowling is "competent to stand trial and is not suffering from a mental disease or defect rendering her mentally incompetent to the extent that she is unable to understand the nature and consequences of the proceedings against her or to assist properly in her defense." A Canadian man who arranged to meet someone for a transaction through the peer-to-peer e-commerce app Kijiji had the phone stolen, from a counterpart who run away into a waiting car. According to North Umberland News, the thief fled in a red SUV vehicle with Quebec licence plates. The owner of a fried chicken restaurant in Champaign, Ill., has admitted that he bought several electronics devices, including MacBook computers, with the intent of reselling them, while knowing the items were stolen. According to the News Gazette, the owner ran an operation where he bought stolen phone and laptops from customers and later sold them overseas. Caught after police used a confidential informant, the owner was sentenced to probation and home confinement. A group of seven teenagers has been charged in the organized theft of 11 iPhones from a pair of stores in Alberta. According to CBC, the teenagers wore winter clothes and stole phones from both an I-World and a Staples in the same mall. The teenagers were arrested following a brief chase. A cell phone store in Memphis called Smooth Wireless was robbed of more than $60,000 in merchandise, including iPhones and iPads. 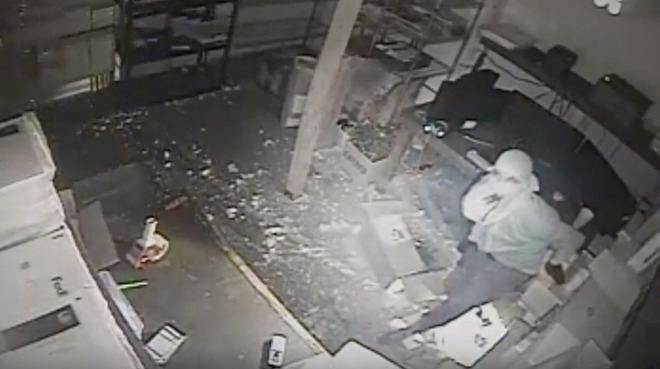 According to Fox 13 Memphis, the masked thieves cut a hole in the roof with a pick-ax, tore the security system off the wall, and quickly stole the merchandise. A man in Singapore was arrested late last month and charged with executing a scam in which he got several people to pay him for Apple products, on which he never delivered. According to Straits Times, the man would collect the money and then disappear. A driver in a white truck and trailer stole an iPhone from another car in the parking lot of a Wawa convenience store in Newtown Square, Pa., according to the Newtown Township Police Department's Facebook page. Commenters on the department's Facebook page recognized the van as possibly belonging to a local tree removal company. There have been several reports of pickpockets stealing iPhones and other phones from customers at a popular Cleveland bar. According to Fox 8, the thief or thieves have "pilfered a large number of smartphones" from patrons at the Around the Corner bar in the city's Lakewood section. Similar crimes have been reported throughout the downtown area.